Conscientiously: Living day to day by the grace of others. 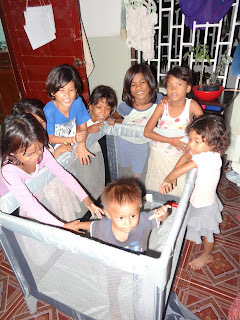 A month or so ago, I joined a Yahoo Online Group of Expatriates living in Cambodia. It’s like a vast information gathering portal where you can also post items you have to sell or want to have. With little Sokah with us again, I was in search of a bed for him. Sokah is a mover! When he sleeps he is ALL over the place. I tried him in bed with me the first time he came but after a sleepless couple of hours, I moved him to a mat on the floor. The problem was that he didn’t stay on the mat, or sheet or blanket. He would scoot in his sleep off of it and onto the cold tile. He wouldn’t keep covered at all. There were nights where I would hear his muffled cry and I would be crawling around on the floor in the dark trying to locate him. He got his head stuck under a cabinet once and another time scooted so far under my bed that I couldn’t find him. I could hear him but couldn’t reach him...It seems he had scooted behind the only storage container I have under there. After that I got serious about finding a bed for him. 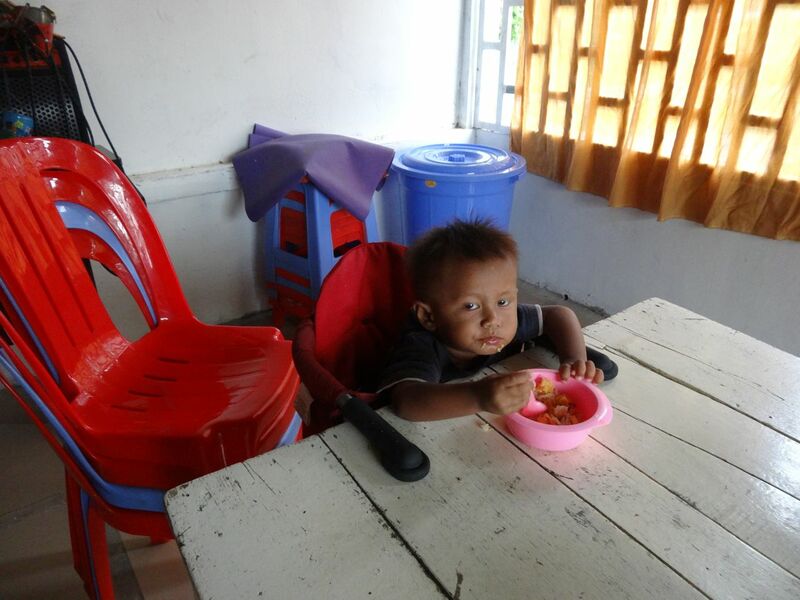 In Cambodia, babies don’t have beds. Usually no one does, it’s so hot most of the time that the floor is the best place to be. I ended up cutting about 6 inches off of the legs of my bed, so I’m closer to the floor. Thankfully I did’t cut off more, or I would never had been able to crawl under and rescue Sokah! 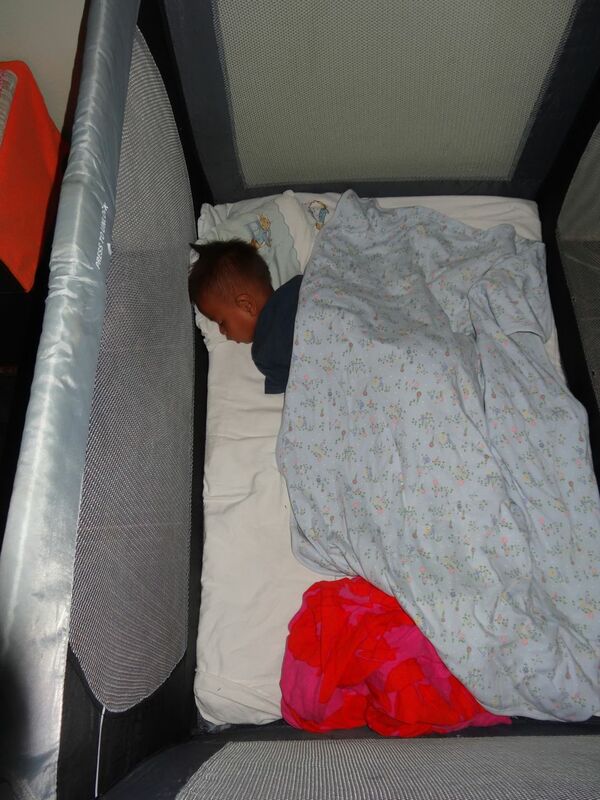 I found a used baby travel bed online – Baby Bjorn brand…which means top of the line in price! It was priced at $130. 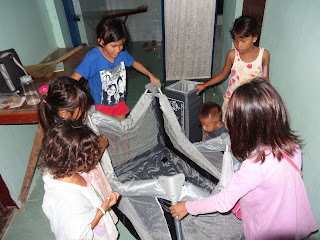 I thought, no way can I buy that one, but I had already checked prices of 'foreign luxuries" (such as a baby bed) in Phnom Penh,and they are crazy expensive and not as good quality, I didn’t know what to do. The seller also had a high chair which clips onto the table which I REALLY wanted as well, but she said it was already promised to another. Currently Sokah is sitting on 4 plastic chairs stacked onto each other. Not the safest choice for an active little boy, plus when he makes his usual mess, I have to clean all 4 layers! I decided I would spend my own money on the bed since I couldn’t justify using Wat Opot’s money; it really was just to make my life easier. After corresponding with the seller, she informed me that she was coming to the town of Takeo on Monday. Wat Opot is situated between Takeo and Phnom Penh, so she was able to drop them off! WAHOO, that was a huge relief since I wasn’t going to go into PP for a few weeks. That was actually the problem with wanting to buy things using the online source because most people wanted the items picked up ASAP. The seller told me that she had a portable crib instead of a travel one, which was bigger and would probably be better for sleeping. And also that the person who wanted to purchase the chair from her didn’t pick it up, so it was available too and she would knock off $10 off of it! She said she also could give me a bag of clothes, and some baby toys if I wanted them!! Happy Happy Joy Joy, it was my lucky day. She arrived by car around 5:00pm and a group of the kids were hanging out playing. When they saw the car, I quickly informed them that it wasn’t a volunteer coming, but someone coming to bring some things for Sokah. They were excited anyway and after a few of them took the chair to the café and 2 boys hauled the bed to my room, the bag of toys and clothes was quickly whisked away to be taken to the new nursery. The kids were as excited as I was even though they knew nothing was for them! When I reached into my purse to pay for everything, the woman told me that she was donating the items and that I didn’t have to pay. WHAT! Wait a minute....I am getting exactly what I needed, plus extra's? HOLD BACK THE TEARS! It’s so hard to not get emotional when you really see the goodness and kindness of others. She told me that her children are the same ages as Sokah and his brothers, not a coincidence I’m sure. I was meant to get these items and it doesn’t so much matter to me who you believe is to receive credit, The Universe, Jesus, Allah, God, Buddha, etc. what matters is that in a time of need, I received. To even further solidify that it was meant to be, is that right after I emailed her a few days ago, I found the identical bed for sale from someone else for $40 cheaper. I quickly emailed that person, but they had a verification on their email and our internet is so slow that it couldn’t display the squiggly letters that you have to type in to verify that you are a human. I was so frustrated trying again and again, but finally decided that my frustration is not worth the savings and I gave up and just decided to pay the higher price. If I look back at my nanny days with a certain billionaire family, I realize I could have (and mostly did have) anything to make my life easier while taking care of their children. Money was never ever an issue. I flew on Private Planes, stayed at 4 Seasons resorts, drove brand new gas guzzling SUV's…but today, I am so overjoyed over a second hand high chair and port-a-crib. Tonight at meditation, I told the kids about the generosity and kindness of the woman and of others. I told them that instead of driving back to Phnom Penh with a lot more money in her pocket, she was driving back with a warm heart knowing she did a wonderful thing. She may even give her own children a little extra long hug tonight. Looking back on the life of ‘luxury’ doesn’t always make me smile, but at this moment, looking down at Sokah getting a good nights sleep warms my heart and causes the corners of my mouth to slowly turn up. Yep, looking back, I am happy to have had all the amazing experiences, but at this time, I can't imagine being anywhere else. I cried with tears of joy , there is hope for humanity. I have a mountain of respect and admiration for you miss Mindy. So if I come to visit I need to bring my inflatable mattress?? Thanks Dee, and if you come visit, I'll find a nice soft bed for you! !